Barbara J. Lawrence has more than two decades of experience in all aspects of estate planning and the administration of trusts and estates. She assists high-net-worth individuals and families in developing customized estate plans to transfer and protect wealth for future generations and achieve their charitable objectives. Barbara’s practice includes advising business owners in connection with the transfer of business interests to the next generation with minimal transfer tax cost and without disruption of the family business. This area of her practice includes developing tax strategies related to crucial transition events in the life of a business owner, such as initial public offerings or sales. 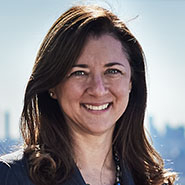 The transfer tax planning strategies she employs include grantor retained annuity trusts, sales to a grantor trust, qualified personal residence trusts, family limited partnerships and limited liability companies, life insurance trusts, dynasty trusts, charitable split-interest trusts and private foundations. She also has assisted nonresident aliens regarding planning for property or family members in the U.S.
Barbara has significant experience administering complex estates and trusts involving substantial real estate holdings and art collections. She has participated with litigators in the representation of fiduciaries in proceedings challenging the manner in which they have discharged their fiduciary duties. Prior to joining Herrick, Barbara was counsel in the New York office of Skadden, Arps, Slate, Meagher & Flom LLP.